January is one of the hottest months for property sales, in January 2017 the property portal Rightmove received 26%* more traffic in this month alone - a huge serge in people viewing properties. So if are thinking of selling and don’t want to miss out on marketing your property in one of the busiest months of the year there is still time, but you will have to work quickly. Contact your local agent such as Intercounty, as they will be able to give you the most accurate valuation. Getting an over inflated price could result in your home not selling, so resist the temptation to go with the highest price - instead base your choice on an agents experience and reputation in your local area. Once you have chosen your agent, make sure you stage your home for a photoshoot. If you have an open fire, make sure you light it, put all the lights on, make the beds, open the curtains, tidy away clutter. Photos say a million words that’s why at Intercounty we have employed the services of a professional photographer, to make sure that your property shines, not matter what time of the year. Finish off any DIY projects and make sure your home look at it’s best. Viewing - once you’ve got your property on the market then you need to make sure it has curb appeal. As the first thing a buyer will see is the front of your property, you need to make sure it looks alluring. Turn on a porch light if a viewing is in the evening, fill up baskets with winter pansies, clear away bins, sweep drives and paths. Light is very important for prospective buyers so make sure your windows are clean and curtains are drawn. Make sure your home feels both warm and cosy. Once completing all the above you and rest assured that your home is wrapped up and ready for the January rush. 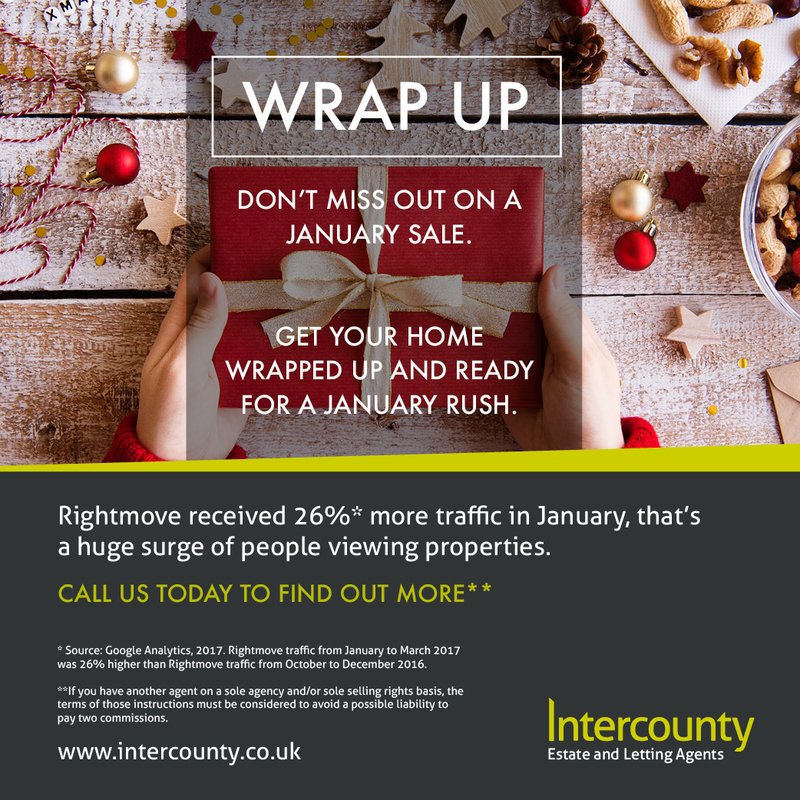 To find out more information about how Intercounty can help you achieve your property goals in 2018 please pop into your local branch for a coffee and a chat or call our team on: 01279 655243.